He says the population kept growing and the persistent geese cause all sorts of problems. “They are up and down the sidewalks, they’re covering the law areas, they are crossing the streets, which stops traffic and gives us an unexpected traffic delay, which is dangerous to the public,” he explains. “And then also on the trails the goose droppings makes it slippery and we’ve had some slipping incidents. 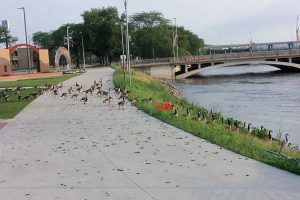 We’ve had interactions with bicyclists where bicyclists have been flown at and charged by geese.” He says they are always getting calls to come pick up geese that had flown into cars or gotten run over. The results of the egg oil effort could start to show in a few months. Neighbor says they should know by this summer how effective the oil treatment has been as the remaining goose eggs hatch and they see how many new goslings there are crossing the streets and in the parks and green spaces. He says it will two to four years down the road to know if they have brought the population to a more manageable level. 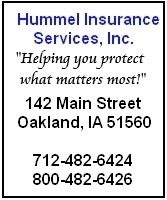 The goose egg oiling was done under the training and supervision of the Iowa D-N-R.